"Is Altar Service Only for Boys?" Is Altar Service Only for Boys? The year 2017 will mark twenty-three years since the Congregation for Divine Worship and the Sacraments formally permitted girls to serve the altar at Mass. There are few topics which can generate as much discussion and debate as this one. For years the faithful have been told that altar girls do not negatively impact priestly vocations. Indeed, far too many have approached this simply as a matter of “gender-equality” for young girls. Some even argue that the Church has spoken and it is time to accept this decision and move on. Nothing could be further from the truth. Born Out of Dissent - First we need to clarify that this is strictly a discussion of Church discipline and not an issue of doctrine. As with several other contemporary crises, the practice of girls serving at the altar was born out of dissent. Despite clarifying statements from Rome in both 1970 and again in 1980, the liturgical abuse still continued. With the revision of the Code of Canon Law in 1983 the opportunity for change presented itself. From the point of view of liturgical law, an official interpretation of Canon 230, Paragraph 2, of the Code led to a 1994 letter from the Congregation for Divine Worship and the Sacraments clarifying that “girls may serve at the altar, but bishops are not bound to permit them to do so.” (Zenit News Agency, “Female Altar Servers,” February 3, 2004). It is also important to note, however, that the same 1994 letter from the Congregation also stated that: “The Holy See wishes to recall that it will always be very appropriate to follow the noble tradition of having only boys serve at the altar.” As is well known, this has led to a reassuring development of priestly vocations. Thus the obligation to support such groups of altar boys will always continue. Much like the excessive use of Extraordinary Ministers of Holy Communion, it is astonishing just how quickly altar girls serving at Mass became the norm. To date, only the Diocese of Lincoln, Nebraska, has never implemented the use of altar girls at Mass in the United States. Priestly Vocations - Regardless of what anyone contends, this is not an issue of gender equality. Indeed, no one has a right to serve at the Mass. As a father of five, four of whom are girls, the equality argument rings hollow to me. To discuss altar girls under the banner of equality is to impose a false, secular notion of participation into the sacred and eternal realm of the liturgy. We all participate in the Holy Sacrifice of the Mass, regardless of what our roles are or aren't. There are two vitally important questions that we need to be asking: First, shouldn’t we do all that we can to assist young men to discern a possible calling to the priesthood? Secondly, if we determine that young men are more likely to discern a vocation to the priesthood by being altar servers, shouldn’t we seek to increase their participation? I have often heard that there isn’t much data to support the argument that altar serving leads young men to the priesthood. This is uniformly untrue. For several years now the Center for Applied Research in the Apostolate (CARA) has conducted an annual Survey of Ordinands to the Priesthood, with typical response rates being between 65 to 75 percent. Questions address such topics as ordinands' age, ethnicity, siblings, education, and participation in parish ministries. 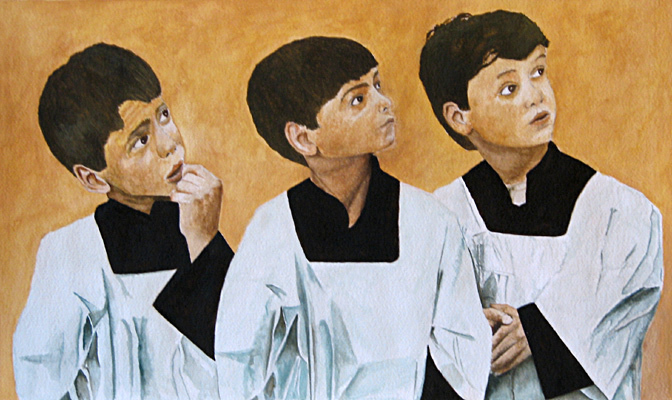 Of the hundreds of men surveyed (who have since been ordained to the priesthood), an overwhelming majority were altar servers during their formative years. Surveys over the last four years provide the following numbers: In 2010, 70 percent of the 339 respondents had been servers; In 2011, 71 percent of the 329 respondents had been servers; In 2012, 75 percent of the respondents had been servers; and in 2013, 67 percent of the 366 respondents had been servers. This is incredibly relevant data which should receive much more attention when discussing this topic. A Return to the Noble Tradition - In July 2005, Catholic World Report published priestly vocation statistics from the previous year for the United States. Conducted over 10 years after Rome officially permitted girls to serve at the altar, it is interesting to note what it revealed. The previously mentioned Diocese of Lincoln, Nebraska (which had never implemented girl altar servers) led the entire nation with one seminarian per 2,625 Catholics. In the intervening years we have begun to see a modest, but consistent, increase in parishes reverting back to a boys-only policy for altar serving. The basic reasoning goes something like this: Boys want to serve with other boys. Returning to the noble tradition of boys-only serving at the Mass facilitates greater participation by young men. These young men, through their years of service, are then assisted in their formation and discernment for a possible calling to the priesthood. From this we then see a steady and consistent growth in men entering the seminary and, eventually, in more men being ordained. Father John Hollowell, with his "On This Rock" blog, has done a great service by conducting a survey of several parishes which have made the switch from co-ed servers to males only. The below chart and data are courtesy of Fr. Hollowell’s research. While the sample size is small, it is still difficult to argue with an average increase of 450 percent in boys serving at the altar. In the coming years it is my sincere hope that more parishes, and even possibly dioceses, take a serious and prayerful second look at their policy for altar serving. Let us remove the emotions, polemics, and agendas from this discussion and simply seek what is best for the priesthood and for Holy Mother Church.